In today’s Baseline shift event, research division lead Alison Black, along with other members of staff including, Jeanne Louise Moys, Sue Walker, Gerry Leonidas and Eric Kindel, discussed and showcased a range of different research projects that they have worked on throughout their careers, as well as discussing current and ongoing projects. For Part 1 students, this was a first experience of hearing tutors speak about their personal research interests. Reading is a research-intensive university, and our Department is ranked 1st in the last UK Research Assessment Exercise for the quality of its design research. For many of us, this stat played a part in why we chose to study here. Jeanne-Louise Moy’s interest in research began in the 1990s whilst working as a designer in South Africa where, at the time, there were many design projects of national importance – for example, redesigning the flag, coat of arms and currency. Companies began redesigning their identities to align with the new democracy, and designers began to experiment and explore the possibilities of a new graphic language. From this point, Jeanne-Louise formed an interest in how “good” newspaper designs, that embodied appropriate design theory, contradicted the emerging possibilities of newer publications, and how graphic language can transform across different platforms. With this in mind, Jeanne-Louise began research on the subject of how typographic presentation influences readers’ judgements. Her approach was to translate the complexity of the wide range of possible variations into artefacts, in order to undergo user testing. This research indicated that people tend to form consistent judgments of documents using similar levels of typographic differentiation, even when the typefaces are kept consistent. Other research projects that Jeanne-Louise has been involved with include working alongside health researchers from the University of Aberdeen as well as working with the Cabinet Office, analysing complex legal documents and how these work as both printed artifacts as well as on emerging digital platforms. More recently, she has been looking at typographic differentiation within digital learning environments, and testing in real environments using real content. As an example of her work in action, Alison explained the process and execution of a research project that involved designing soil moisture forecasts for farmers in Northern Ghana. This project was carried out by Alison and Matthew Lickiss alongside a research team in the Meteorology Department at the University, who produce climate and weather models from which forecasts can be made. Alison and Matthew’s task was to find out how to make this data interpretable by a range of Ghanaian farmers, some of which were non-readers. This involved user testing with the farmers of northern Ghana to arrive at largely pictorial displays of data . The final product used illustration and limited text, which made it clear and easy to use. Another research project that Alison discussed was providing information to support carers of people with dementia. Making information manageable, usable and appropriate was the main goal. Alison explained that she began her research by working in discussion groups with carers, which revealed that the had difficulties using the information they had received, with one saying that he kept all the information in a big carrier bag, but never used it. The next step was to make prototypes for user testing and gathering feedback to create a final handbook with clear and visually appealing information about dementia and how to care for for people with the condition. 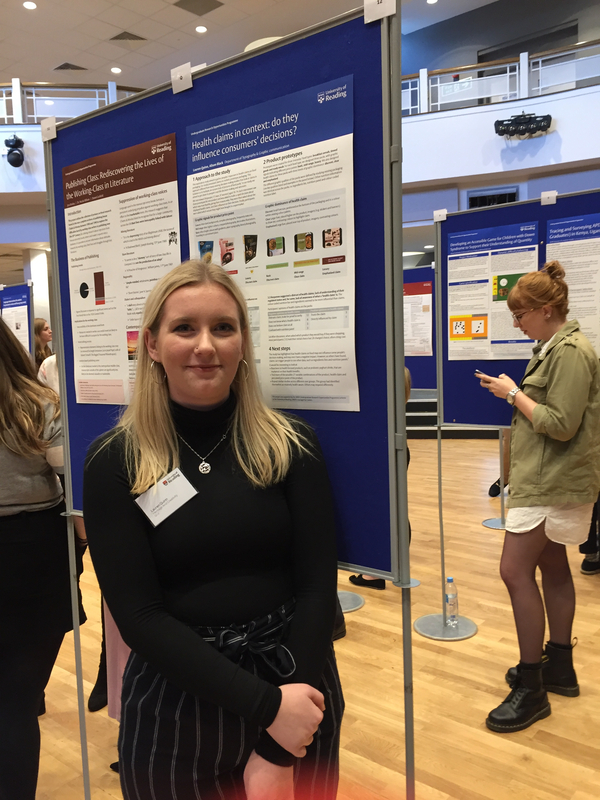 Recently, Alison also completed a research project that explored the presentation of health claims on food packaging. For this project she worked alongside Lauren Quinn, a part 3 student, who completed this research as part of The Undergraduate Research Opportunities Programme. They aimed to find out whether or not the heavily regulated health claims influenced the buyer’s decision or whether the packaging design was of more importance. They designed three different variations of packaging, each time varying to graphic style and also prominence of health claim and completed user testing in order to collect data. Overall it appeared that the imagery and design of the pack had a larger impact and was more influential than the health claims themselves. After this event I spoke with Lauren Quinn (pictured below, presenting a poster about the project), who explained how beneficial this project was, and how she learnt a lot of specific research techniques such as collecting qualitative data efficiently. Sue Walker has a particular interest in children’s books and how information is presented to young children. 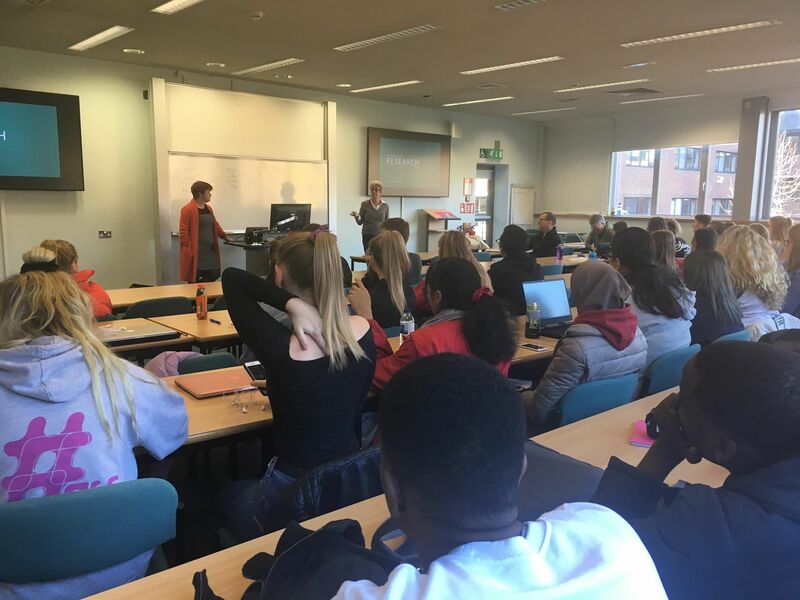 However, today she discussed a research project that focussed on how you can use an indoor environment to engage people with important topics, such as antimicrobial resistance, titled “IDAPPS – Information design and architecture in persuasive pharmacy space: combating AMR”. The team for this project included people from several different departments in the University including Architecture, Pharmacy and external partners, too. The aims of the project were to reduce antibiotic misuse which could, in the long term, lead to our being unable to use antibiotics to combat microbial infections. With the focus being on community pharmacies, they worked with the Day Lewis pharmacy in Woodley to develop and test design proposals. As Sue has a passion for using archives for research purposes, the Departments collection of Isotype posters detailing how to fight tuberculosis became the starting point for this project, and she began by looking at other examples of Isotype work from the 1920s. Five different external design teams proposed solutions to the communication problem and Sue highlighted two initial proposals; the first being life-size cutouts of illustrated people which carried messages about antibiotics and were displayed in and around the pharmacy. The second solution were rotating cubes, which each told a different story about resistance when you twisted them. The cubes were accompanied by other communication tools, including knitted bugs, which were inspired by the large shelf of knitting wool displayed in this particular pharmacy. Some of these bugs talk and explain different information about antimicrobial resistance, whilst one of the bugs is made using a thermochromic wool and therefore it changes colour to show a good bug changing into a bad bug. Sue stated that this was a fairly risky and challenging project, involving people from different disciplines, and a lot of information to pull together in a very short time, in order to create a successful outcome. Among other roles, Gerry Leonidas is the Programme Director for MA Typeface Design, and Enterprise Coordinator for the School of Arts & Communication Design. He began by explaining how much of his research involves typeface design, which he describes and “a social enterprise”. Gerry took us through some of the history of typeface design and the research that he has done alongside colleagues. He described Fiona Ross’s current project, looking at the role of women in typeface design history. He explained how these women changed the world of communication, but their names were unfortunately never recorded. Further discussion was made on how there are different factors that affect whether a typeface work well, and what criteria we can use to judge them. Fonts are to be looked at in the context of their use, and analysed based on their appropriateness. Eric Kindel described always having had a love of graphic design and being interested in how information is presented graphically. In the early years of his research career, he also became interested in editorial design due to his passion for writing and history. The three research pursuits he spoke about were: print effects, graphic information and stencils (which he claimed to be one of his “nerdy” devotions). Eric showed us some of his early writing on print effects in an article about moirè effects in print, in Eye Magazine. In terms of graphic information, Eric has worked with other researchers in the department on the Isotype Revisited project. Some of this research can be seen the isotyperevisited.org website and a number of different elements came out of the research, including an exhibition at the in Victoria & Albert Museum. Another follow on from this project is the current Picturing science for children, which can be followed on its vibrant twitter account. Eric has conducted detailed research into the use of stencils. He has been involved in reconstructing all the stencil maker’s tools and desks for stencilling and in order to understand the techniques that have been used historical to create stencil letters. He worked collaboratively with typeface historian, James Mosley, and typeface designer, Fred Smeijers, in this historical reconstruction project. 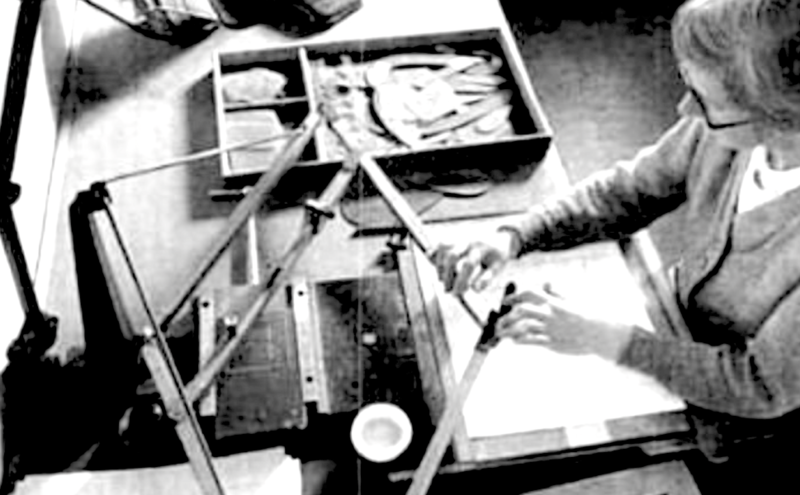 Eric explained how Fred Smeijers made the stencils and Eric used them, as a stenciller would have done, for his research. He showed how combining letter stencils made in two halves make the letter look like it hasn’t been stencilled at all. He also talked about Benjamin Franklin’s stencil set, and how he has traced the history of the Parisian stencil maker, Jean Gabriel Bery, who made it. Another element of this stencil research includes gathering examples of stencils used for advertisements on walls in 19th century, France. This practice arose to circumvent taxation on paper posters. The research topic is an ongoing one, with a plan for publication sometime soon. 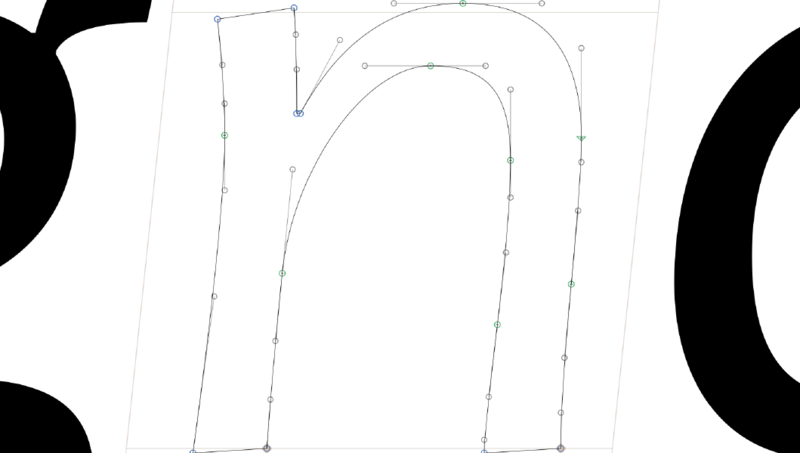 Updates to follow on typography.network!